Hi, there. 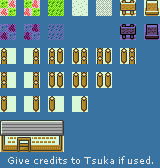 I started a new GBC Hack (Pokémon Purple) and I´m learning to do gen II tiles. You can use them if you want as long as you give credits to me. You can ask for any tile too, I'll try to do it. I added a couple more, hope you like them. I have to say that the first two (flowers) are part of an animation. Excuse my grammar, I'm from Spain. It's great to see more "tile workshops" being made. Won't be needing any of these myself but if you come up with something "old-looking", that's something I could use in my hack (and no, this wasn't a request to make those kind of tiles, just saying).